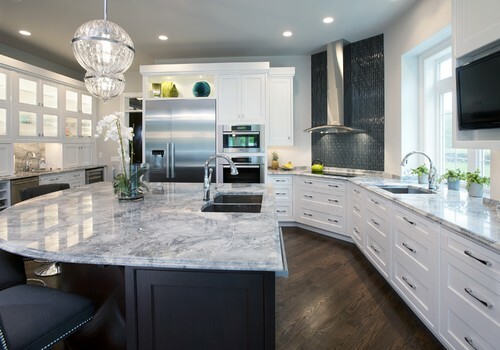 White Fantasy Granite is to be picked by many homeowner, who are in the kitchen remodeling process are looking for granite that looks like marble. However, marble has such a unique beauty. Actually, there is a little confusion when seeking the right stone with the correct name. The quote “ white granite looks like marble: white fantasy granite” may be replaced with “ Quartzite: white fantasy”. Since she is well know as white fantasy granite, I should use the previous quote:By picking the white fantasy granite, the questioning consumer may have a smart question in his mind to minimize this confusion. Why quartzite is a better alternative than marble? Let me educate these hungry minds:There are three main natural stone materials in kitchen countertop industry. These are granite, quartzite and marble. Both granite and quartzite are igneous rocks but marble is metamorphic rock. Metamorphic rocks are more fragile, vulnerable to stains and permeable to keep the liquid in their body. Marble is more porous than the quartzite and granite. Since it has a risk of break down and staining, marble is not a good choice at all. On the other hand, the glamour of quartzite can be seemed in the first sight. White Fantasy Granite is the first known quartzite material in kitchen and bath designs. She has the visual pattern of white carrara marble and she has almost the same quality of granite. These two parameters make her unique and way of expensive than the other stones. White Fantasy Granite is also called Super White. Her two sisters are Princess White, and Bianco Macabus or White Macabus. When I read about the granite, quartzite and marble, I am very inspired with their own unique beauty. And the beauty touch looks like feminine. So instead of putting the article “it”, I prefer to use “she” like what Rudyard Kipling did. If you would like to have White Fantasy Granite, you should stick the all white, gray and black tones for traditional and contemporary kitchens. If you are seeking some modern look, white fantasy goes for red, blue, yellow cabinets. She is capable to make very good connection with those colors. White Fantasy Countertop with Green Base Island and Chestnut Cabinets. Rustic and white fantasy all the greens and chestnut are in harmony. Lovely. Picture credit: Codginc. After reading this article, Granite Countertop: Kitchen Countertop Materials could be very helpful for your right granite choice in your kitchen renovation.